For the most part, Friends was a pretty lighthearted show. I mean, that's what sitcoms are all about, right? Well, because most people on the internet are dark and soulless, fans can't help but break our hearts by creating sad fan theories about beloved characters like the ones on Friends. This time, one fan focused on Chandler, and honestly, I'm not okay. As I'm sure you are aware, Chandler Bing and Joey Tribbiani have one of the most iconic TV friendships of all time. Joey moving out of the apartment was the saddest breakup storyline on Friends, and yes, this is a hill I am willing to die on. Obviously, Friends wouldn't have been half the show it was if it wasn't for Joey and Chandler's friendship. I mean, come on! They co-created Fireball! They're bracelet buddies! Sure, I was happy for Chandler when he moved in with Monica, but I definitely missed all the hilarious and adorable Choey moments. For this theory, it's important to remember that for as long as Friends was on the air, the Chan-Chan man lived with a roommate. Ross, Phoebe, and (briefly) Joey lived alone — unless you could Phoebe's imaginary roommate, Denise — while Monica, Rachel, and Chandler always lived with another person. Even when Joey moved out, Chandler lived with a dehydrating maniac named Eddie. However, one fan recently pointed out that Bing-A-Ling probably didn't actually need to live with a roommate. Unlike his friends, Chandler pretty much always had stable work. I mean, he was a very successful "transponster"! So why didn't Chandler ever give solo living a shot? A new and heart-wrenching theory explains why Chandler opted to live with a roommate, and honestly, it's lowkey sad. I literally always forget that Joey wasn't always Chandler's roommate because their bromance is iconic. However, Chandler actually turned down Joey's rental application in favor of some other dude who was thankfully scared off by Mr. Heckles. So just to recap, Chandler was actively looking for a roomie when he met Joey because his former roomie had moved out. Kip, we hardly knew ye. For the most part, the characters in Friends that have roommates seem to require them because they aren't financially stable enough to live on their own, but Chandler totally could. Before you say it, I get that New York City is expensive, but Chandler had enough money to cover Joey's expenses and still save enough to pay for Monica's dream wedding, so we know he had enough money for his own digs. Clearly, he lives with a roommate because he wants to. According to this theory, Chandler's traumatic childhood is a huge part of why he doesn't want to live alone. As we know, Chandler aka The Boy Who Hates Thanksgiving had a pretty rough childhood. He was an only child to wealthy parents who didn't take an active interest in him and involved him in their messy divorce at a young age. Chandler probably spent a lot of time alone before he met Ross in college. We can assume that his relationship with his family was strained because we know that Chandler spent most holidays with Ross's family instead of his own. Also, he talks about his issues with his family all the time. 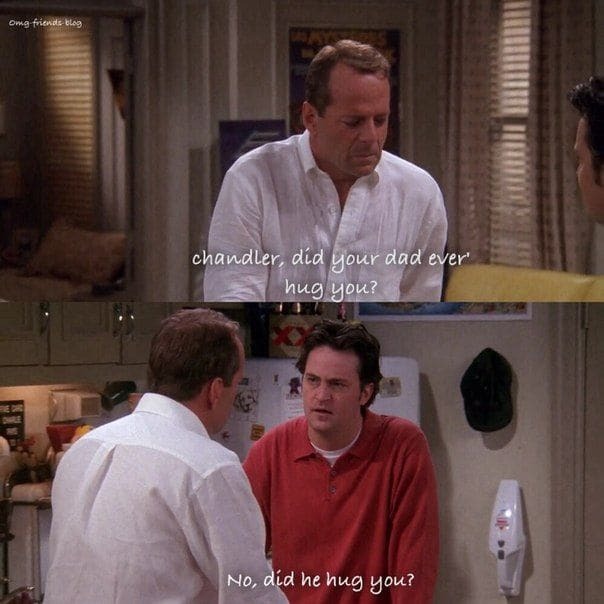 "Chandler has classic abandonment issues. He wants the company and attention that he lost when his parents separated," wrote the Reddit user. I mean, think about it! Most people would not put up with Joey as a roommate, but Chandler happily covered Joey's expenses for years and hardly ever complained. Also, remember when Joey moved back in? Joey explained that he wasn't just moving back because he had to financially. He was also moving back in for the friendship! Well, Chandler immediately seemed to understand that sentiment and simply said, "Welcome home, man." And then they danced and jump-hugged, and everything was right with the world. So basically, Chandler puts up with living with a roommate like Joey because he doesn't want to be alone. I'm sorry if this was obvious to some of you, but I'd literally never thought of their relationship in this way before and it hurt my Friends-loving soul. What do you think of this theory? COMMENT and let us know, and TAG a friend!